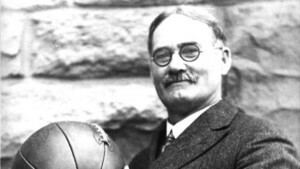 In 1891, Canadianborn Naismith was an instructor at the YMCA International Training School in Springfield, Massachusetts. In search of way to increase YMCA attendance during the winter, he invented an entirely new indoor game, which he called basketball. It used a ball and two peach baskets as goals, and because it was intended for indoor play, players were not allowed to tackle or otherwise make contact with one another, nor were they permitted to run with the ball. Basketball quickly developed into one of the most popular games in the United States.